Employing the same Richard Avedon portrait that graced the cover of the 1970 double-LP The Lotte Lenya Album, this collection is an abbreviated version of that compilation, cut down to fit the length limit of a single CD. 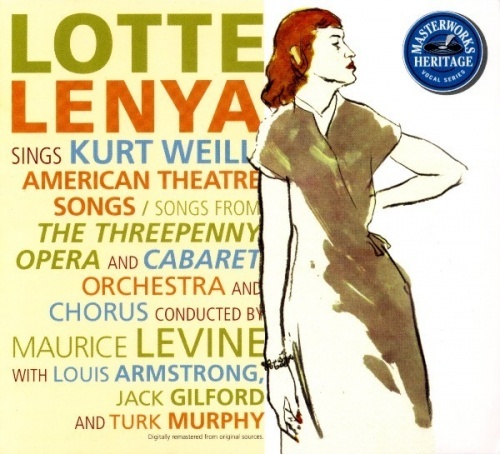 The Lotte Lenya Album was nothing more or less than a two-fer repackaging of the single LPs Lotte Lenya Sings Berlin Theatre Songs by Kurt Weill and September Song and Other American Theatre Songs by Kurt Weill. For this version, the last four songs from the former ("Was Die Herren Matrosen Sagen," "Ballade vom Ertrunkenen Mädchen," "Lied der Fennimore," and "Cäsars Todd") have been deleted to bring the total running time down to 70 minutes. Thus, the first eight tracks find Lenya in Germany in 1955, singing mostly in German songs composed by Weill with lyrics by Bertolt Brecht from their stage works Die Dreigroschenoper ("The Threepenny Opera"), Aufstieg und Fall der Stadt Mahagonny ("Rise and Fall of the City of Mahagonny"), and Happy End, while the last 12 tracks find her in the U.S. in 1957, singing in English songs from Weill's Broadway musicals Knickerbocker Holiday, Lady in the Dark, One Touch of Venus, The Firebrand of Florence, Street Scene, Love Life, and Lost in the Stars. Lenya always disputed the notion that there were two Weills, the Berlin Weill and the Broadway Weill, but she ended up reinforcing that argument with these two LPs, and juxtaposing two-thirds of one with all of the other on this disc does not disprove it. Lenya was the definitive interpreter of the Brecht/Weill catalog, of course, and when she came to make the recordings here she had been singing (and recording) songs like "Seeräuberjenny" ("Pirate Jenny") and "Surabaya-Johnny" for more than a quarter-century. It's no surprise that she sounds assured on the first eight tracks, which use the original orchestrations for small jazz band conducted by Roger Bean. It's a different story with the Broadway tunes that make up tracks 9-20, however, as Maurice Levine conducts a string orchestra on songs for which other singers have done memorable treatments, including "September Song," "Saga of Jenny," "Speak Low," and "Lost in the Stars." With her limited range and German-accented English, Lenya is not the best interpreter of this material, and she does better with the less familiar songs, such as "Sing Me Not a Ballad," which actually was written for her to sing in the unsuccessful operetta The Firebrand of Florence. As such, the decision to excise a third of the Berlin album is all the more questionable.